This is a Historic English Bishop Costume Image! This one was scanned from a new addition to my collection, it’s from a rare Circa 1846 Ecclesiastical Costume book. Shown here is a 14th Century English Bishop costume. As you can see the Costume is made of white and gold cloth with touches of hunter green and red. An interesting costume image! 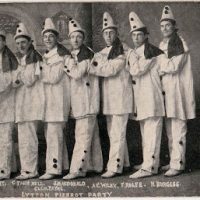 Old Photo – Pierrot Clown Costume Party Vintage Adorable Child in a Furry Hat and Bow Image! 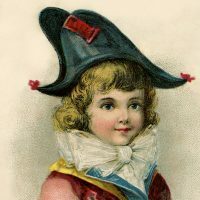 Darling Bicorne Hat Boy Image! « Public Domain Violin Image!